Walk around the halls of Mobile World Congress (MWC) and you’ll find cars everywhere. All the tech brands want in on the exciting automotive world, but Ford, now an MWC regular, has left the cars at home this year. Instead, the company has focused on other forms of transport which complement traditional vehicles, and how these futuristic forms of transportation fit into city life. This is Ford’s city of the tomorrow, where drones deliver your groceries, you don’t own a car, and a little robot takes you from your car to your front door. Why is Ford interested in this space? Walk around the halls of Mobile World Congress (MWC) and you’ll find cars everywhere. All the tech brands want in on the exciting automotive world, but Ford, now an MWC regular, has left the cars at home this year. Instead, the company has focused on other forms of transport which complement traditional vehicles, and how these futuristic mobility platforms fit into city life. This adorable, Pixar-inspired bot, is our favourite finalist. Carr-E is a form of personal transportation, similar to a hoverboard, you stand on it and shift your balance to steer. It’s been designed to fit inside your car’s spare wheel compartment, making it easy to transport. The idea is that you park up, get Carr-E, and use it for the final mile of your journey, rather than getting the Tube or bus. As the name suggests, Carr-E can also carry heavy packages for you in ‘Drone Mode’. This sort of device will become even more popular when city centres become more pedestrianised and ban high-emission vehicles. Online shopping is placing a strain on local delivery services, so there’s a growing pressure to solve this challenge. Unfortunately, the last 15-metres is considered the most challenging part of the goods delivery process to automate. AutoLivery is a fully autonomous drone delivery system (automatic delivery, get it? ), which we actually experienced in a very realistic VR demo. Self-driving vans quickly and efficiently transport goods along the ground, with drones taking to the air for the final leg of the journey (dropping of goods on a tower block balcony, for example). This could be used for everything from groceries to medical supplies, and stops delivery vehicles from parking in difficult, impractical, or unsafe locations. How far away are we from making this a reality? 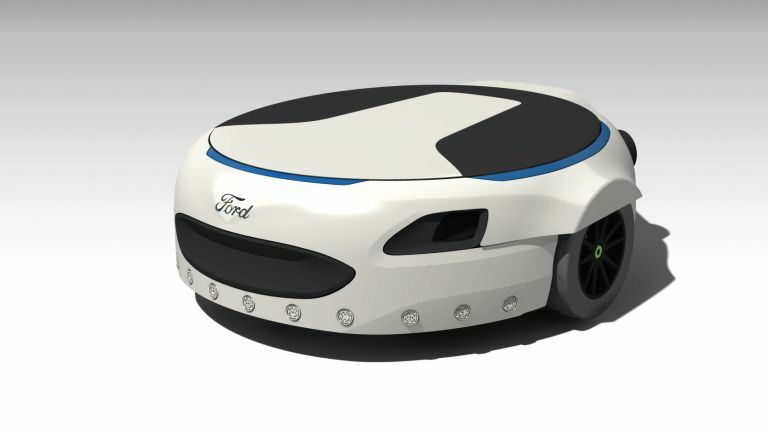 Ford intends to have a fully autonomous, SAE level 4-capable vehicle (that's highly autonomous, on a scale of 0 to 5) for a commercial purpose by 2021. This will be used for mobility services such as ride sharing, ride hailing, or package delivery. It also expects electric cars to outnumber petrol vehicles in the next 15 years. Obviously, setting up a commercial drone operation in a heavily populated area will take a little longer. The final winning concept is TriCiti, an electric tricycle which can be used for consumer and commercial applications. Delivery drivers (this is before the drone revolution) can use TriCiti to carry heavy parcels from their vans to people’s front doors. The system is flexible, and can fold up when not in use and be hung inside the van door. Alternatively, you could rent one of these while shopping to hold heavy purchases, ride between locations, carry luggage, or even a baby seat. Like a more useful Boris bike. We’re not sure if any of these concepts will ever see the light of day, but it’s certainly got us very excited about the future. City life is about to change dramatically in the coming years, and it’ll be pioneering mobility companies like Ford which will be leading the charge - make suer to stay tuned to T3 for the latest developments.